The EMD GP10 is a diesel-electric locomotive that is the result of rebuilding a GP7, GP9 or GP18. The Illinois Central Railroad had three separate rebuild programs to upgrade their old EMD GPs and GPs that they had purchased from equipment dealers such as Precision National Corporation in Mount Vernon, Illinois. The first was the GP8, second the GP10 and third the GP11. All were rebuilt at IC/ICG's Paducah Shops in Kentucky. Core units for the GP10 program were from IC/ICG GP7, GP8, GP9 and GP18, B&M GP9, B&O GP9, CC&O GP9, C&O GP7 and GP9, D&RGW GP9, DT&I GP7 and GP9, FEC GP9, GTW GP18, P&LE GP7, Potlach Forests Inc. GP7, QNS&L GP9, RDG GP7, St.J&LC GP9, SLSF GP7, SP GP9, SSW GP7, and UP GP9B. Two IC GP9s were rebuilt to GP10s and sold directly to the Ashley, Drew and Northern Railway. Nine Alaska Railroad GP7s were rebuilt to GP10s by Paducah. A total of 76 Conrail GP9s were rebuilt to GP10s. The Paducah Shops rebuilt 53 Conrail GP9s to GP10s. 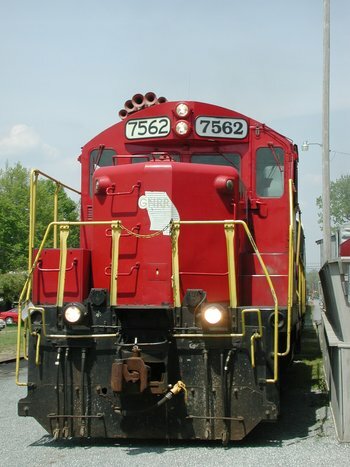 The first 16 Conrail GP9s were rebuilt to the equivalent of a GP10 in 1976. In 1978 another 21 Conrail GP9s were rebuilt at Paducah, followed by 16 more GP9s rebuilt to GP10 in 1979. The 1978–79 Conrail GP9 rebuilding program by Paducah was engine and electrical gear only with no carbody modification. The Precision National Corporation Shops at Mount Vernon, Illinois rebuilt six Conrail GP9s to GP10s in 1978. The Morrison-Knudsen Boise Shops rebuilt 17 Conrail GP9s to GP10s in 1978-1979. Six units were rebuilt by Boise in 1978, with an additional 11 units completed in 1979. The GP9 rebuilding program by Boise was engine and electrical gear only with no carbody modification. This sound recording courtesy of Blue Ridge (GA) Scenic/Heritage railroad. Unit# 7562 has conventional 567 prime mover. All sounds recorded by AJ Ireland at Blue Ridge GA in 2006. Note: The normally aspirated 567 prime mover has significant low-frequency components at idle and low notch settings, so the speaker enclosures should be as large as possible behind the diaphragm to extend adequate frequency response below e.g. 300Hz. This will ensure a more "full" sound that does not appear thin or "tinny"
For CV155=01 ["Semi_automatic Notching"], the Prime mover lowest Notch setting is set by the throttle speed setting. F6 (ON) can increase the Notch and F7 (ON) will decrease the Prime mover to the minimum notch set by current throttle setting. If you leave F5 on, you can wind the engine handbrake forever!! This sound recording courtesy of Blue Ridge (GA) Scenic/Heritage railroad. Unit# 7562 has conventional 567 prime mover. All sounds recorded by AJ Ireland at Blue Ridge GA in 2006.